When I was little Julie Andrews was the star of 2 of my favourite films - Mary Poppins and The Sound of Music. The Sound of Music was never far from our video player and I could often be found swooshing round the living room imagining I was at a ball in the Von Trapp's chateau or dancing in the summer house with Rolf as the rain poured down outside. I still cry when Maria and Captain Von Trapp have their first kiss. 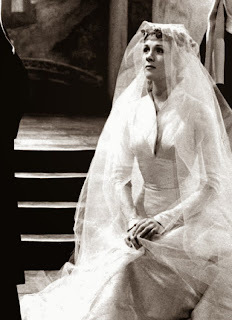 Their wedding was so beautiful and Julie Andrews looked so graceful in Maria's wedding dress. The real Maria wore a floral garland in her hair on her wedding day similar to the one chosen for Julie Andrews. Until my wedding dress arrives I haven't made any firm decisions on what way I will have my hair styled. Will I have a veil or some flowers incorporated into my hair like Maria? Possibly... I think flowers would probably look better with my dress than something really sparkly. 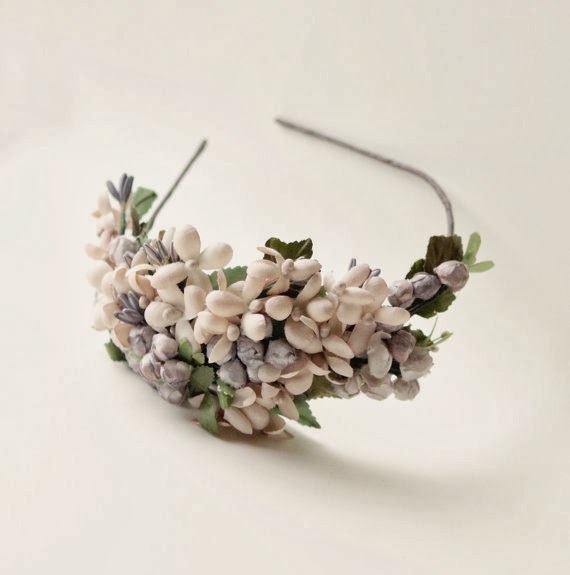 Having a browse on Etsy I found this gorgeous Bridal Fascinator which would be a lovely alternative to fresh flowers.